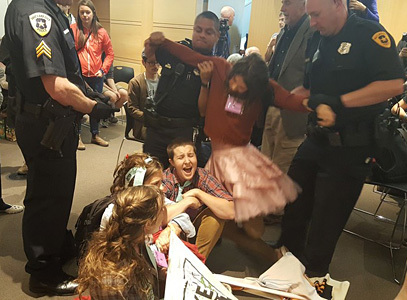 SALT LAKE CITY—Dozens of people disrupted another Bureau of Land Management’s oil and gas lease sale in Salt Lake City. 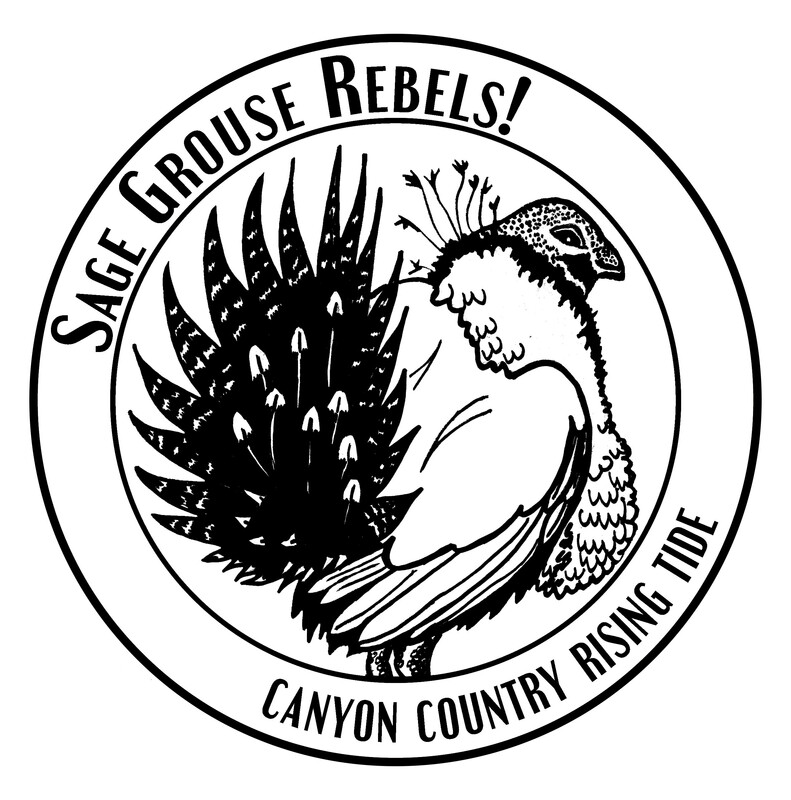 This action is on the heels of other large “Keep It in the Ground” protests and disruptions calling for an immediate end to all fossil fuel development on public land. As soon as the auction began, many members of the audience erupted into song. The police quickly told everyone that they would be asked to leave if they continued to sing. The audience continued, and the police started removing people by force. A small group linked arms and sat down. Wave after wave of people continued the song in rounds. Eventually everyone singing was hauled out by police and the auction continued. The BLM’s “climate auction,” as protesters dubbed it, allowed industry to bid on oil and gas leases for more than 6,000 acres of publicly owned land in Utah. Some of the protesters entered the auction venue and were removed by authorities. Demonstrators are forcibly removed from today’s #KeepItintheGround rally in Salt Lake City. Photo by Valerie Love, Center for Biological Diversity. Photos are available for media use. Federal coal, oil and gas leasing are responsible for a stunning one-quarter of U.S. greenhouse gas emissions. By ending new leasing on public lands and waters, the president could lock nearly one-half of all U.S. fossil fuels safely in the ground. The message to markets and to other nations from such an action would be unmistakable. Instead the president has leased millions of acres of public lands to dirty energy companies, with oil production on federal lands up 62 percent since he took office. The rally is part of a rapidly growing national movement calling on President Obama to halt new federal fossil fuel leases on public lands and waters. Since November protested lease sales have been postponed in Utah, Colorado, Montana, Wyoming and Washington, D.C.
Groups participating in today’s rally include Elders Rising, Science and Environmental Health Network (SEHN), WildEarth Guardians, the Center for Biological Diversity, Wasatch Rising Tide, Canyon Country Rising Tide, Great Old Broads for Wilderness, Fossil Free Natural History Museum of Utah, SLC350 and BreakFree2016.org. Some 67 million acres of U.S. public lands are already leased to dirty fossil fuel industries, an area 55 times larger than Grand Canyon National Park, and containing up to 43 billion tons of potential greenhouse gas pollution. Nearly one-quarter of all U.S. climate pollution already comes from burning fossil fuels from public lands. Remaining federal oil, gas, coal, oil shale and tar sands that have not been leased to industry represent half of all U.S. carbon pollution. In September more than 400 organizations called on President Obama to end federal fossil fuel leasing. In November Senators Merkley (D-Ore.), Sanders (I-Vt.) and others introduced legislation to end new federal fossil fuel leases and cancel nonproducing federal fossil fuel leases. Last month the Obama administration placed a moratorium on federal coal leasing while the Department of the Interior studies its impacts on taxpayers and the planet. Since November 2015, in response to protests, the BLM has postponed oil and gas leasing auctions in Utah, Colorado, Montana, Wyoming and Washington, D.C.
Download The Potential Greenhouse Gas Emissions of U.S. Federal Fossil Fuels (this report quantifies the volume and potential greenhouse gas emissions of remaining federal fossil fuels). Download The Potential Greenhouse Gas Emissions fact sheet. Tags: #KeepitintheGround, climate justice, just transition, oil & gas lease sales, take action! The next Federal BLM Lease Sale for Oil & Gas is in Salt Lake City on Tuesday morning. Show up, show our power. DENVER – Hundreds of community, climate, and fracking activists today protested a Bureau of Land Management (BLM) oil and gas lease auction at the Holiday Inn in Lakewood, Colorado. Roughly 300 activists from Colorado and surrounding states marched to the BLM auction, carrying signs, banners, art, and singing chants. From there, a contingent of over 100 risked arrest by entering the hotel lobby and hallways, many of whom physically blocked the entrance to the auction room. The blockade and the crowd held the space for over two hours, delaying and disrupting the auction. The protest was organized by a coalition of groups led by local Colorado activists. It was part of the larger “Keep it in the Ground” movement, which is calling on President Obama to halt new federal fossil fuel leases on public lands and waters, a move that could keep half of American fossil fuel reserves from being burned, and protect these resources for generations to come. Activists from all across the country attended today’s action, showing solidarity with local activists and drawing attention to a rising public lands movement in Western states that has been challenging BLM auctions for the last six months. Colorado’s public and private lands have been pockmarked by oil and gas wells in recent years. The state has also seen firsthand many of the devastating impacts of climate change, including massive flooding and extended, more intense fire seasons. The action comes just days after the Colorado Supreme Court denied community authority to regulate fracking. The coalition, made up of local groups including CREED, FrackFree Colorado, Colorado 350, Colorado Rising Tide, and many others, and supported by national groups including Greenpeace, Rainforest Action Network, Center for Biological Diversity, WildEarth Guardians, and 350.org was brought together as part of the Break Free global month of action. Artwork was designed by First Seven Design Labs and the Radical Arts Healing Collective, and built out by local community members. The coalition is now turning its attention to Saturday the 14th, when hundreds of community members will converge in Thornton to call for an end to fracking development in communities and on private lands. They will be joined by journalist Bill McKibben. Tags: #KeepitintheGround, just transition, oil & gas lease sales, take action! Today, over one hundred people erupted into song and disrupted the Utah Bureau of Land Management’s (BLM) oil and gas lease sale in Salt Lake City, Utah. The auction was then closed to the public as the entire audience was escorted outside. Activist and author, Terry Tempest Williams, attended and purchased several parcels totaling 1,751 acres in Grand County, Utah through a company she formed called Tempest Exploration. One was an 800 acre parcel 14 miles from and within view of Arches National Park that was leased for $1.50 / acre / year. The group of grassroots organizations, representing a broad-reaching alliance of community members, packed and overflowed the auction room. They rallied and marched outside, and then came into the auction, spontaneously singing songs as the parcels were auctioned off until they were forced to leave. Today’s protest and Williams’ actions are yet another sign of the growing energy and momentum of the “Keep It In The Ground” movement calling on President Obama to define his climate legacy by stopping all new fossil fuel leases on public lands and oceans. In recent months, local residents and activists in Utah and in states across the country have protested outside BLM fossil fuel auctions. Since November, in response to protests, the BLM has canceled oil and gas leasing auctions in Utah, Montana, and Washington, DC, and this strategy has already gained the attention of leaders in Congress, in the Obama Administration, and on the 2016 campaign trail. Cindy Lewis of Wasatch Rising Tide. Tags: #KeepitintheGround, oil & gas lease sales, take action! Celebratory Rally in front of the BLM offices in Salt Lake City. Dozens of citizens were planning to protest the auction on Tuesday morning in Salt Lake City. Instead, they will now celebrate the Bureau’s decision to postpone the auction of 73,000 acres of publicly owned oil and gas in Utah — which harbor an estimated 1.6 – 6.6 million tons of potential greenhouse gas pollution. The planned protest had been led by elders calling on the BLM to act to prevent catastrophic climate change and to ensure a livable future for generations to come. The victory is the latest from a rapidly growing national movement calling on President Obama to define his climate legacy by stopping new federal fossil fuel leases on public lands and oceans – a step that would keep up to 450 billion tons of carbon pollution from escaping into the atmosphere. Similar “Keep it in the Ground” protests were held in Colorado and Wyoming in recent weeks and more are planned for upcoming lease sales in Reno, Nev., and Washington, D.C.
A number of national and local groups are coming together to demand that fossil fuels stay in the ground, including ‘Elders Rising’ – a group of seniors concerned for their children and grandchildren in an age when catastrophic climate change is destroying the possibility of a livable future. Elders Rising is joined by national groups Rainforest Action Network, the Center for Biological Development, the Women’s Congress for Future Generations, Canyon Country Rising Tide, and WildEarth Guardians in calling for inter-generational justice and an end to fossil fuel development. The American public owns nearly 650 million acres of federal public land and more than 1.7 billion acres of Outer Continental Shelf — and the fossil fuels beneath them. This includes federal public lands like national parks, national forests and wildlife refuges that make up about a third of the U.S. land area — and oceans like Alaska’s Chukchi Sea, the Gulf of Mexico and the eastern seaboard. These places and fossil fuels are held in trust for the public by the federal government; federal fossil fuel leasing is administered by the Department of the Interior. Over the past decade, the combustion of federal fossil fuels has resulted in nearly a quarter of all U.S. energy-related emissions. An August report by EcoShift consulting, commissioned by the Center for Biological Diversity and Friends of the Earth, found that remaining federal oil, gas, coal, oil shale and tar sands that have not been leased to industry contain up to 450 billion tons of potential greenhouse gas pollution. As of earlier this year, 67 million acres of federal fossil fuel were already leased to industry — an area more than 55 times larger than Grand Canyon National Park containing up to 43 billion tons of potential greenhouse gas pollution. More than 400 organizations and leaders in September called on President Obama to end federal fossil fuel leasing. They included: Bill McKibben, Winona LaDuke, Robert F. Kennedy Jr., Dr. Noam Chomsky, Dr. Michael Mann, Tim DeChristopher, Dr. Stuart Pimm, Dr. Michael Soule, United Auto Workers Union, Unitarian Universalist Association, Physicians for Social Responsibility, Protect Our Winters, 350.org, the Center for Biological Diversity, Environment America, Friends of the Earth, Food & Water Watch, Indigenous Environmental Network, Oil Change International, Greenpeace, Rainforest Action Network, REDOIL, Sierra Club, Great Old Broads for Wilderness, Waterkeeper Alliance, WildEarth Guardians and hundreds of others. This past weekend, people from various parts of Eastern Utah who are organizing to stop tar sands and oilshale development in the region came together to demonstrate their solidarity with Flood Wall Street and the People’s Climate March in New York City. 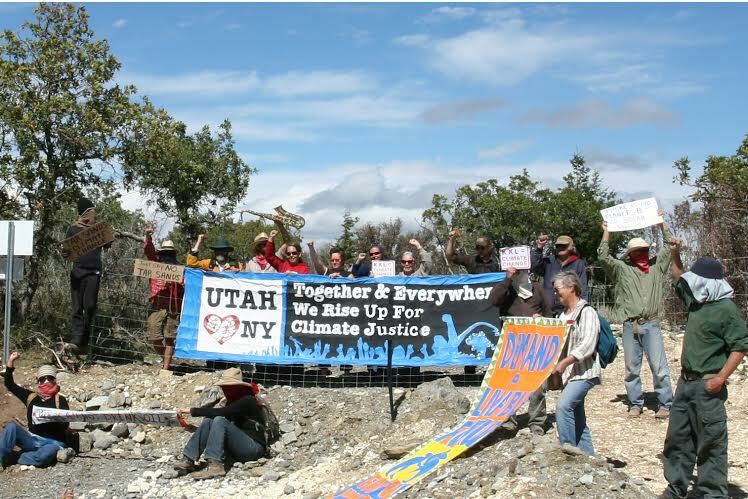 The group, consisting of Uintah Basin oilfield residents, Moab community members living downstream from the proposed tar sands mine, and a handful of other folks from Utah and Colorado, marched to the site of the first commercial tar sands mine in the US, located at PR Spring on the Tavaputs Plateau. As the international movement for climate justice continues to grow, and as hundreds of thousands of people take to the streets to challenge the logic of unchecked industrial development and fossil fuels extraction, people on the front lines, like those in Eastern Utah, are strategizing, networking, and taking bold direct actions to defend their communities from the profit-driven belligerence of the oil and gas industry. Tags: #KeepitintheGround, Flood Wall Street, take action!